are made from the old phallus. 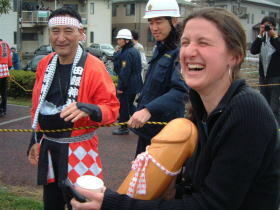 and funny festivals in Japan. However it has also serious sacred meanings. and it is the time which plants come into bud and feel the power of life. for the world peace, luxuriance or a rich harvest of cereals and prosperous life. which gives life to all nature. Oo-owasegata is not a portable shrine but a offering. What a brave lady ! carpenters for shrines and temples. Nagano Pref., and takes approximatery 10 days to carve. including the covering it's carried with. Wow ! Enjoy the festival ! service cart. You can drink as much as you want. but it's takes almost 1 hours and half. 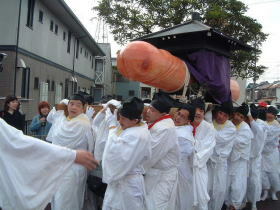 Because on the way to Tagata-Jinja shrine, the parade often stop and attract visitors. 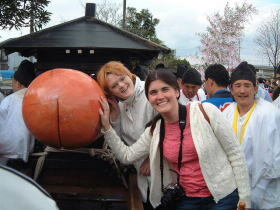 We can touch or hold or ride on the Oh-owasegata (see the photos). which also carried as a part of the parade. * Otabisho is a smaller shrine or temporary shrine like a villa for gods during a festival. and shinmeisha (in even number years. 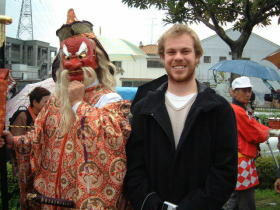 500 meters from Tagata shrine). 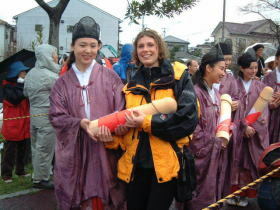 After the CNN introduced this festival, so many foreigners come and enjoy. Maybe more than 20 to 30% of the visitors are foreigners. 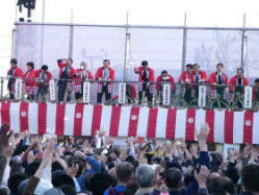 10:00 a.m.- Setting the OoOwasegata and other items to the Otabisho. or Shinmei-sha (shrine ) to pray the safty of the procession. odd number years (Kumano-sha) or even number years (Shinmei-sha). Please ask the station attendants if you don't know well. Get off the train at Tagata-Jinja-mae. From the station, just follow the other people headed to the festival. It takes 25 minutes from Heiandori to Tagata-jinja-mae Sta. You can use "Yurica tranpass card". 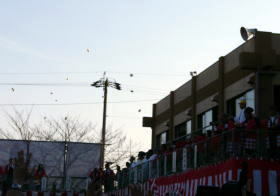 152, Tagata-cho, Komaki City, Aichi Pref.